A grilled cheese is the perfect platform for all sorts of goodness. Hearty wheat bread, extra sharp cheddar, caramelized veggies – this wasn’t the kindergarten kind. I purchased a mini whole wheat boule at the grocery store on my way home from work. It was cute and screamed portion control. Truth be told, I would have finished whatever sized sandwich that was placed in front of me. So tonight, the mini-er the better. In a medium sized frying pan over medium heat, melt 1 tablespoon of the butter. Add shallots and mushrooms and cook over medium heat until caramelized. Add a handful of spinach and stir until spinach is wilted. Place half of the cheese on once slice of bread and the other half of the cheese on another slice. Add half of the veggies to one slice of bread and the other half of the veggies on another. Sandwich the veggie halves with the cheese halves. In the same frying pan, melt 1/2 tablespoon of butter over medium heat. Place the sandwiches in the butter and cook over medium heat until the bread is browned, checking frequently. Remove the sandwiches from the pan and add the remaining 1/2 tablespoon of butter to the pan. Place the sandwiches back in the pan, uncooked side down, until the bread is browned and the cheese is melted. 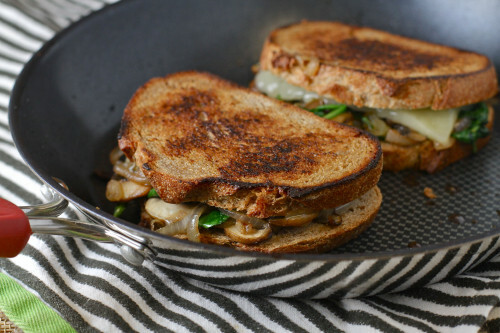 grilled cheese is always a strong option and i looooove caramelized onions and mushrooms!!! and with cheese?? oh baby!! I get hungry again just thinking about it!